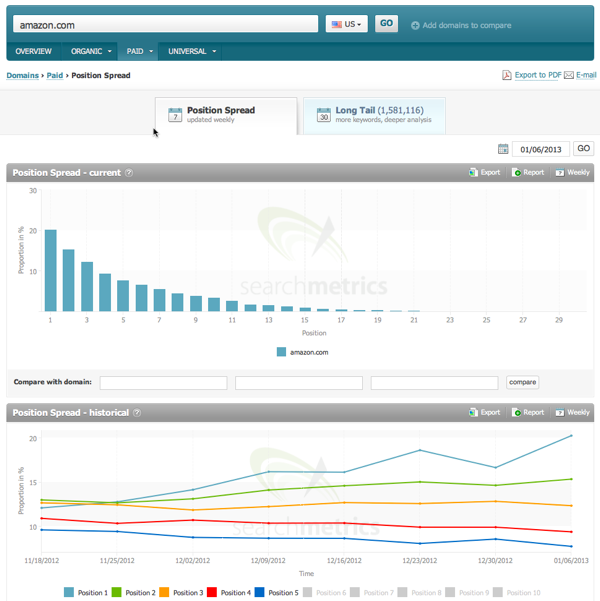 Searchmetrics offers a wide array of products targeting independent webmasters, small agencies, and enterprise-level agencies. For the purposes of this review we’ll be focusing on the Essentials Plus suite, which should suffice for most independent webmasters. To start a project you enter the domain or sub-domain you, keywords, and search engines you want to track for your project. You can select from a wide range of countries as well as inside specific Google locales (this can be helpful for Local SEO). Once you finish up with the keywords you can add competitors manually for benchmarking or click the Suggested Benchmarks tab and see the competitors Searchmetrics feels is relevant. The last step is to connect your web analytics account if you’d like (Google Analytics). As part of their Rankings tool you can see SEO visibility going back 2 years as well as benchmarks against the competitors you entered in areas of link data, rankings data, keyword counts, and social metrics (these areas are based on current data). On the keyword piece of this module you’ll see overall visibility, keywords that have gained and lost positions, as well as overall keyword coverage and potential. Each of these areas offer the ability to drill down further, beyond the overview page. The Competitive Analysis feature of the Rankings module shows you additional competitors for your keywords as well as their historical trends for the keywords you are monitoring. Also, you get up to date information on competitor changes so you can spot competition that is trending up relatively quickly. The Links module gives an overview of current link landscape of your site with data on total links, referring domains, and anchor text data. 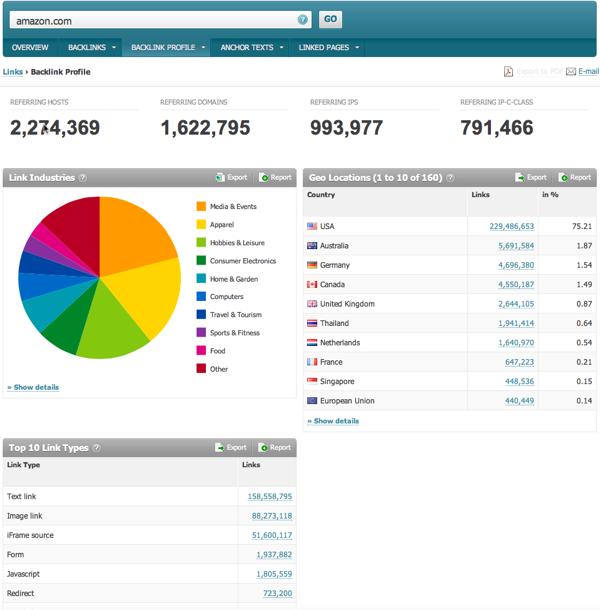 You can also view the page strength of each link as well as location breakdown of the link profile. You can also filter links by follow/no-follow, page strength, and custom text strings (if you wanted to see links that contain X word or phrase as an example). 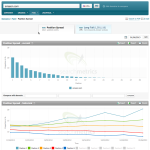 Searchmetrics also includes an Optimization module that reports on site optimization as a whole (404 errors, no-index tags, duplicate titles, and other features you see in competing commercial optimization tools) and keyword optimization. 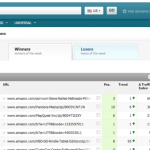 The keyword optimization tool shows on-page scores for each keyword as well as current rank and volume. The final module available is the Research module. You can research the visibility and spread of domains, keywords, backlink profiles, as well as social metrics. One of the neat features inside of the initial site set up is the ability to add keywords via a keyword suggest tool that is available when you are entering your keywords. They also offer a standard keyword research tool in the same interface but the cool thing with the suggest feature is it will show you where the entered domain ranks for that specific keyword. 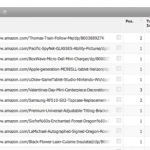 You can also add and tag keywords from these interfaces. 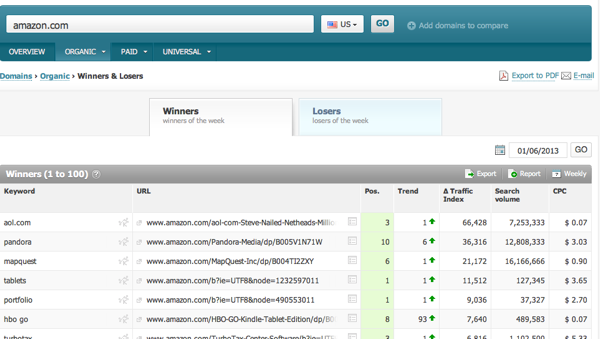 Another unique feature is that you can see the top 50 rankings for a given keyword and the associated domain movement within the last week. This can help you spot sites that are doing things correctly (or incorrectly) so you can get a better, more real-time handle on what might be working vs what isn’t. You might find yourself in a position where you do not have historical rankings at your disposal. 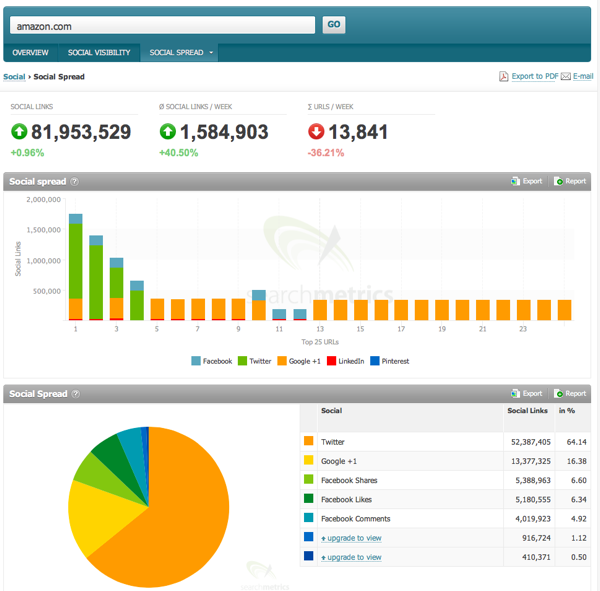 You can access up to 2 years worth of historical traffic data inside of this tool. Historical ranking access can be a major factor in diagnosing if a site has been hit by a major algorithm update or if certain tactics caused specific ranking (traffic related) issues with the site. As search results become more and more ubiquitois across multiple search types, having access to universal ranking data becomes more useful. The above verticals are available in both domain and keyword level research modules. In PPC and organic research modules you’ll get access to the spread of each site across their keyword sets. When doing competitive research this can be helpful in determining whose strategy is working and whose isn’t based on which site is top ranking for more terms compared to the other. From just about any data set you can click on the Report icon and get access to an easy to use, white label reporting system with the ability to add the ranking charts, images, and custom text to the report . In this particular plan only the chart data is available for report creation. 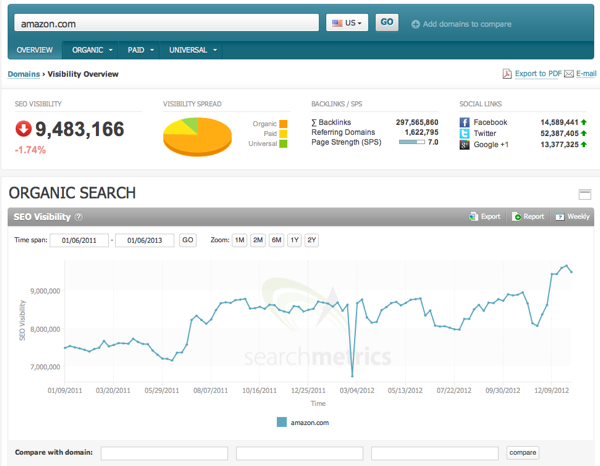 Searchmetrics is very easy to use and includes lots of helpful charts. Near each section of a given result is a question mark bubble which tells you exactly what the data is referring to. Sometimes the charts load a bit slow but overall the experience is quick and crisp. It’s clear that a lot of thought went into the UI of the site as everything is easy to understand, logically grouped, and clearly explained. Data is extremely exportable into a variety of formats (PNG, PDF, .csv). 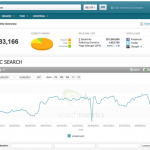 Searchmetrics collects data from Google, various 3rd party social sites, as well as from their own internal database to help deliver its results. 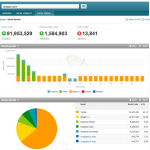 The size of their proprietary database is approximately 100,000,000 keywords. Some of the metrics inside of Searchmetrics update weekly (your keyword data as an example, though you can choose daily) and the larger database is refreshed monthly. Searchmetrics breaks down social signals so you can see the pages on a domain with the highest likes, shares, +1’s, pins, and LinkedIn shares. The 3 features mentioned above can be combined to really help streamline your content creation and promotion ideas. It can also give you a good idea of what social pieces might fit into the market you are in (are major sites in your market or lateral markets heavily weighted to one or only a couple social sites?). 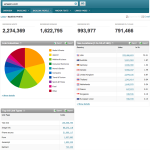 You can research the competition as well as get an overview of how your site is doing in various universal search results as well as compare up to 4 sites. This is especially helpful if you are an e-commerce site trying to get a handle on shopping results or if your market involves a fair amount of play in Google News, Videos, and Images. There are a dizzying amount of options and tools available in the various subscriptions they offer. While choice is good it can also cause some confusion. Really analyze what it is you need to do with the tool and pick based off of that. The higher level plans are quite pricey and are aimed at the enterprise market. Plans start at 99$ and go up to 949$ per month. There is also a custom pricing solution if you need to go even higher. Currently there is no free trial available but they do have a free account you can use where they offer SEO and Social visibility as well as limited views of organic, paid, and universal results and competitors. Coupons for this tool generally run during the last quarter of the year. As of this writing none exist but you can check back and search for discounts and coupons during the year (some are sure to pop up).